Vegetables are healthy. That is a fact. How we cook them decides whether the nutrients stay within the prepared meal. 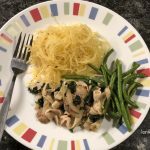 One vegetable that is easy to cook and that ends up looking deceptively like spaghetti is the Spaghetti Squash. I had no knowledge of its existence until I saw it on a grocery store shelf, here, in America. Only recently did I indulge my curiosity and brought home a squash fit to feed a small army. 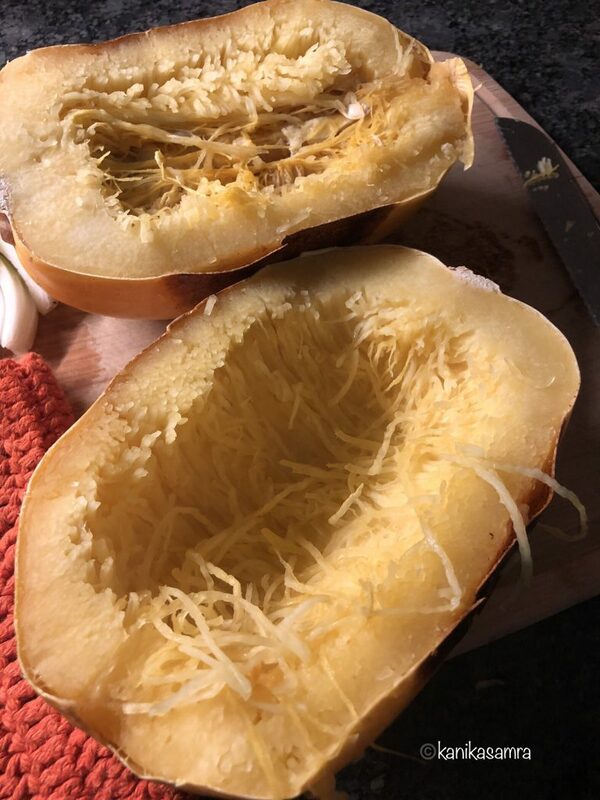 The spaghetti squash like some other varieties has a tough skin that can seem impenetrable, even with a sharp knife. But once its been sitting in an oven for well over half an hour even a blunt knife will cut into it like butter. That’s the beauty and science of cooking. Squash or Pumpkin, Varieties Galore! The spaghetti squash is from the cucurbita family of vegetables which yields a large variety of pumpkins. 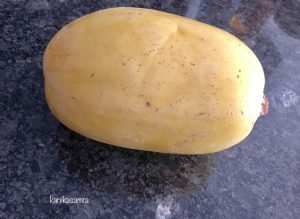 The most common type that I grew up eating in India is known as Kaddu – also a generic term for pumpkin – a fleshy pumpkin with either a beautiful jade green skin (also a variety) or slightly spotted green skin (a variety called Amir). Both kinds have a rich, orange pulp that can be easily cleaned and chopped before cooking. My favorite recipe for cooking kaddu is an Indian savory method that you can find on the blog. Finding varieties of pumpkin with flesh that is tough and difficult to cut was quite surprising. 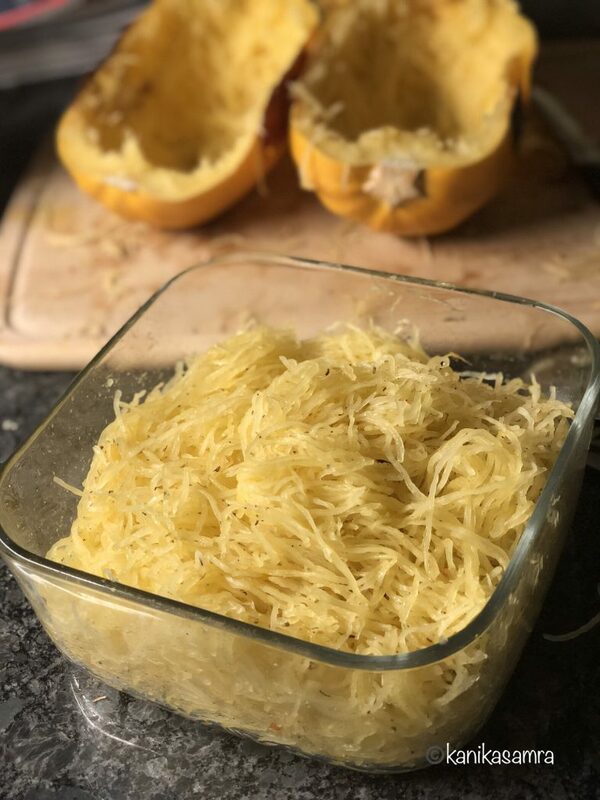 Best though was when I learned about the Spaghetti Squash – I couldn’t believe that a pumpkin could transform into linguine without a spiralizer. The process of cooking the squash is really easy and results in noodles that are slightly crunchy with a good bite that can stand up to any sauce. Inactive ~ 5 minutes, Active cooking ~ 45 minutes. Fork to scrape the flesh into noodles. While the oven is getting ready, wash the squash and pat the skin dry. There are two ways to cook the squash. Cooking it whole – Prick all over and then roast for 1 hour and 15-20 minutes. The spaghetti squash has a very tough outside, so be careful. One method to avoid an injury would be to wedge the squash between something stable. But if that’s not possible, nevermind. It will cook just as well without any cuts. The skin will start browning. Check at the halfway mark and turn the squash over. Close to 40 minutes, use a knife to check. If it cuts through easily the squash is done. Cooking halves – If you are able to half the squash, then scrape the seeds and pulp in the center. Place the halves with skin side on the baking sheet and roast for 30-40 minutes. Test by poking a knife into the flesh, it should give way easily. Spaghetti Squash out of the oven. If you cooked the whole squash then once its done, cut it into half and scrape the seeds out. Making the linguine: After this it’s time to pull out the linguine. To do this use a fork and gently scratch the flesh of the squash. It will automatically pull away in a string like form; very similar to a linguine. Empty into a serving bowl. To season warm up oil in a pan and saute garlic. Then, add salt, pepper and red chilli flakes. Pour this over the linguine and toss well. Linguine is ready to be served with any sauce of your liking. 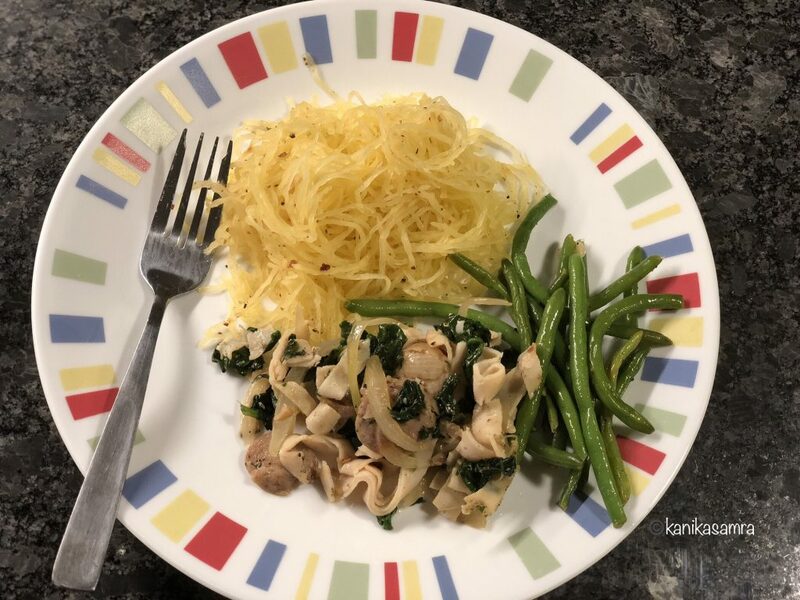 The linguine has a mild flavour and goes well with any kind of sauce.We enjoyed it with a side of french beans and sautéed spinach and cured turkey meat. Let your imagination run wild and savour this healthy replacement to regular pasta. Wash and then prick squash all over. Roast on the central rack for 1 hour and additional 15-20 minutes until the skin is brown and easily gives way when poked with a fork. If you are able to half the squash, scrape the seeds and pulp in the center. Place the halves with skin side on the baking sheet and roast for 30-40 minutes. Test by poking a knife into the flesh, it should give way easily. Use a fork and gently scratch the flesh of the squash. It will automatically pull away in a string like form; very similar to a linguine. To season warm up oil in a pan and saute garlic. Add salt, pepper and red chilli flakes. Pour over linguine and toss well.